When the 34-year-old Smith wasn’t carving up the Arizona defense, the 33-year-old Peterson was running through it. The result was a 24-6 Washington victory on Sunday, coach Jay Gruden’s first win in a season opener in five tries, and it was even more dominant than the final score would indicate. 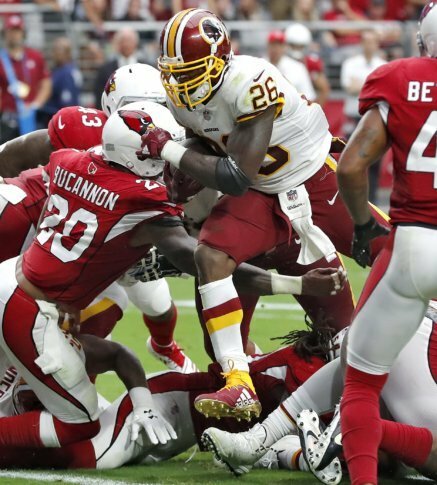 The Redskins outgained the Cardinals 429-213 and had 30 first downs to Arizona’s 14 and it was even more one-sided before the Cardinals showed some life late in the game. Washington rushed for 182 yards to Arizona’s 68. The statistics were stunningly one-sided through the first two quarters: 261 yards for the Redskins to 36 yards for the Cardinals. Smith completed 17 of 20 passes for 171 yards and two touchdowns. Bradford, meanwhile, was 3 of 7 for 11 yards. Washington had the ball for 22 minutes, 57 seconds to the Cardinals’ 7:03. After Arizona’s first three-and-out, Washington used up 9:06 in a 15-play, 73-yard drive, Peterson plowing in from the 1-yard line to make it 14-0. Rookie wide receiver Cam Sims injured an ankle in the first quarter and was carted off the field. He did not return. Washington wide receiver Trey Quinn left in the third quarter, also with an ankle injury, and didn’t return. Redskins safety Troy Apke left with a hamstring injury in the fourth quarter. Redskins: host Indianapolis next Sunday. Washington hasn’t started 2-0 since 2011.